This exhibition at the McNay Art Museum, San Antonio TX (on through May 19, 2019) explores the ingenuity and innovation of the post-war period known as America’s Golden Age. 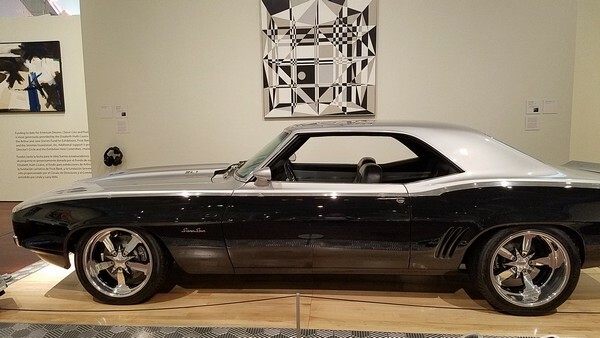 The American Dreams: Classic Cars and Postwar Paintings exhibition highlights the surge of Abstract Expressionism, Pop art, and Op art, coincident with the mass production of automobiles that kept pace with America’s growing wealth and consumerism. 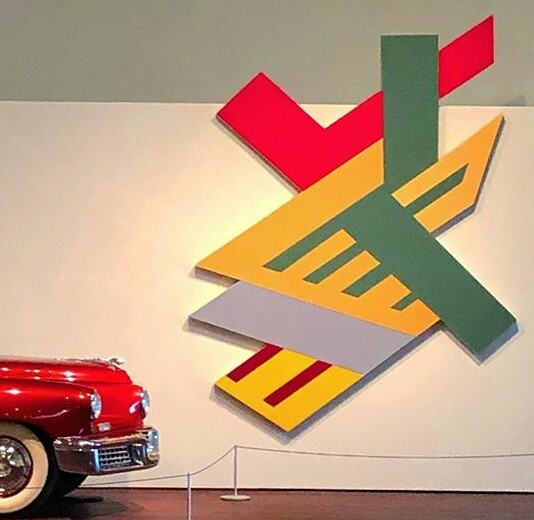 Ten classic American cars are presented as modern sculptures of steel and vinyl, juxtaposed with paintings from the McNay’s collection of post-war abstract paintings and a few select loans. Called “dream cars,” these classics of the 1950s and ’60s sported exaggerated tailfins, wraparound windshields, and shining chrome. 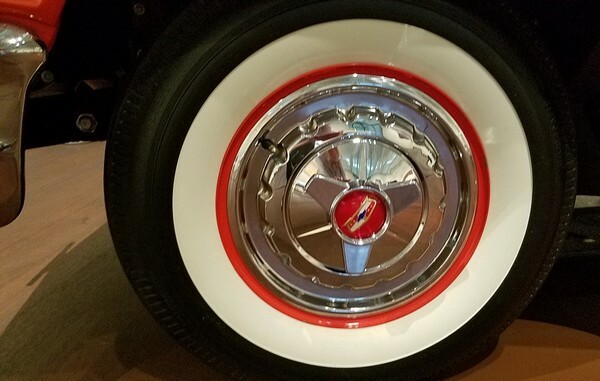 From a rare 1948 Tucker Torpedo—one of only 51 Tuckers ever made—to the beloved 1963 Chevrolet Corvette, a pinnacle of vintage ’Vette design, many of the cars on view pushed design boundaries through expansive volume, notice-me color combinations, and highly-styled flourishes. 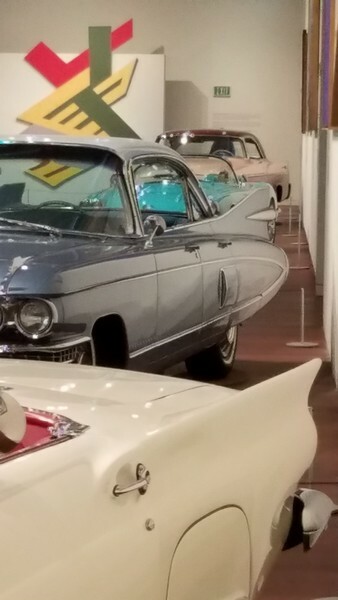 From nose to tail, the longest model Cadillac ever produced. 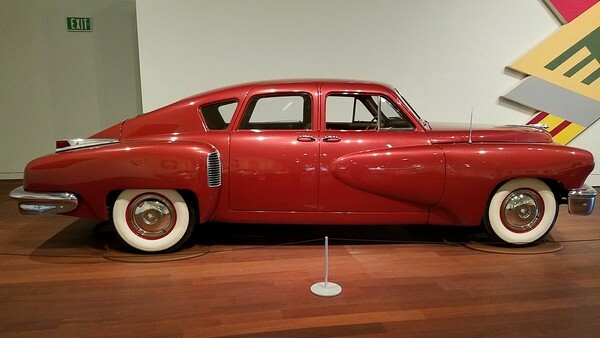 1948 Tucker Torpedo introduced safety innovations that would become industry standards. This Tucker was the very last of the 51 produced. The Tucker was paired with a super-sized, angular, relief structure by Frank Stella (American, b. 1936). “You can tell a story with shapes,” he once said. This piece is from his Polish Village series, a series which gave him a new appreciation of geometry. A brilliant pairing was the 1969 Chevrolet Camaro and Space Frame C by Edna Andrade. Customized “Silver Spur” 1969 Chevrolet Camaro, owned by Larry Mills, member of the Board of Directors of the San Antonio Spurs, paired with Space Frame C, 1965, by Edna Andrade. An early leader in the Op Art movement, Edna Andrade (American, 1917-2008) used pattern and color to create optical illusions. This hypnotic painting is a disorienting yet orderly arrangement of interlocking geometric forms in black, white and gray — looking for all the world like a fractured mirror reflecting the black and silver and chrome of the Camaro. It’s delightful … It’s delovely .. It’s DeSoto! 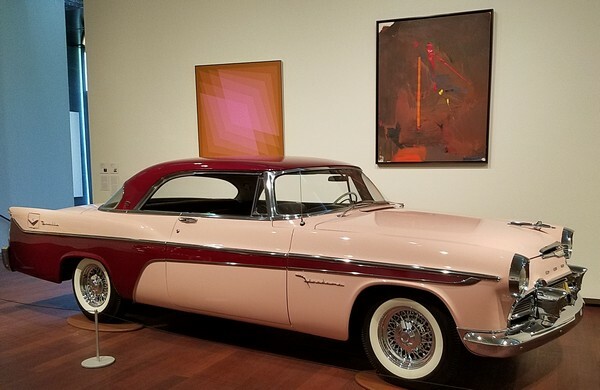 The image above shows a Chrysler DeSoto Firedome Seville still gleaming with the original two-tone factory paint-job of Shell Pink and Iridescent Plum. The car is offset by Julian Stanczak’s 1973 Western Color (left) and Hans Hofmann’s Le Déluge of 1964 (right). 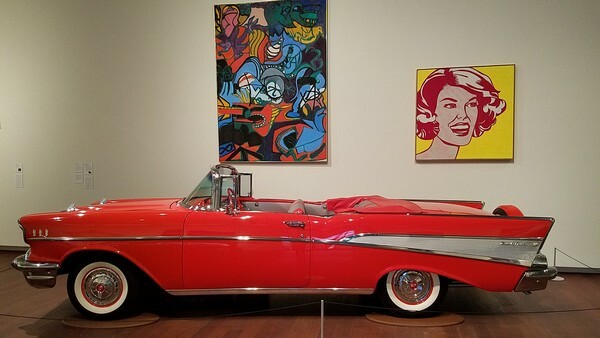 The 1957 Bel Air was inspired by jet fighter airplanes, incorporating “chrome hood rockets, bumper bullets, and classic tailfins.” Shown above the car are works by Grace Hartigan (American, 1922-2008) (left) and a classic Roy Lichtenstein (American, 1923-1997) (right). Hartigan’s The Far Away Places (1974) shows that in her later career she began to introduce figurative elements into her work. In this tightly-organized composition we see hints of foliage and beasts emerging from the abstraction. Roy Lichtenstein’s adaptation of comic book and advertising imagery is well know to us today, but his originality placed him in a leading role in the Pop Art Movement in the 1960s. The piece in this show, Head — Red and Yellow, was inspired by a newspaper ad showing a laughing woman tossing a beach ball. Maybe she was happy because she drove to the beach with her beau in a “sweet, smooth, and sassy” Matador Red Bel Air! 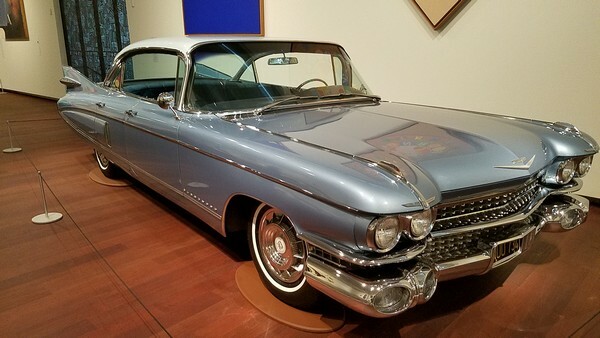 American Dreams: Classic Cars and Postwar Paintings is on through May 19, 2019.